Last February the US government announced that it would no longer allow commercial imports of African ivory of any age, including antiques – which were previously exempt. This ban promises far-reaching consequences for the African art market. US dealers, who previously bought ivory works of art from overseas with the intention of reselling them in America, can no longer do so. On the other hand, EU dealers will no longer find clients for their ivories in the US. Domestic and export trade will become limited to artefacts more than 100 years old. Unfortunately, it’s often very difficult to prove an object is demonstrably more than a century old. The purpose of the expanded federal ban, clearly, is to drive down the demand for African elephant ivory by making trade illegal. In fear of further, perhaps worldwide, bans, it’s a likely scenario that collectors will become more and more reluctant to acquire ivory objects. Without a free market to allow the trade of ivory objects, it could of course very negatively impact their value in the long term. Since it is not sales of genuine antiques in the West that is fuelling the largest demand for new ivory, but the insatiable and undiscerning appetite of Chinese and South-East Asian buyers, many antique dealers and museum curators are currently attacking the prososed new legislation. They rightfully claim certain provisions in the National Strategy for Combating Wildlife Trafficking will have a drastic impact on exhibitions, scholarship and the trade in antique masterpieces, while doing nothing to stop the slaughter of an endangered species. You can read more about the issue here. More technical details can be found here. To be continued..
An ivory Luba mikisi mihasi pendant. Image by Paul Lois. Photo courtesy of Patrick Mestdagh. Published in: BRUNEAF, XVII, 2006: p. 81. 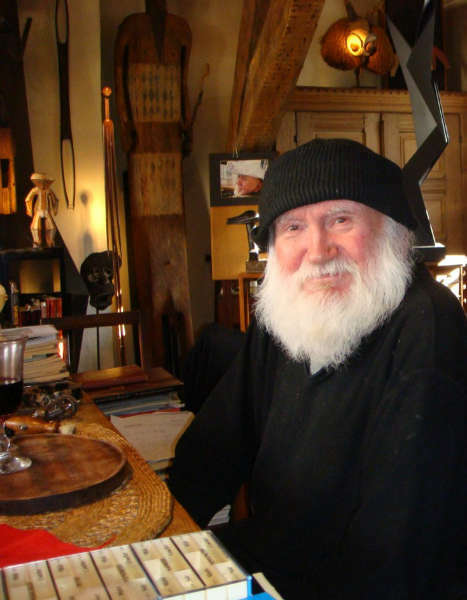 Last Saturday, 22 March 2014, the quintessential artist-collector, Jean Willy Mestach, passed away. His passion and eye were inspirational for a great many collectors. Mestach understood African art as no other. An artist himself, his collection was unmatched in terms of personal aesthetic choices, generated by a strong emotional and intuitional response to African art. 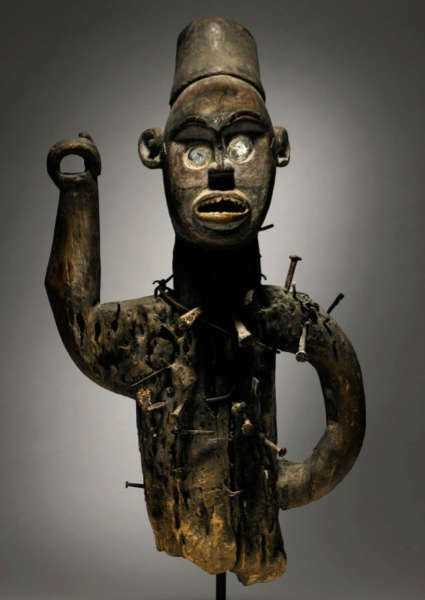 Each object in his collection related integrally to all others, creating an ensemble widely considered as one of the best collections of African art ever and a work of art itself. I was fortunate enough to visit his apartment that looks down over the Sablon once in 2008, which for me was a life-changing experience. In his studio, a magical place, Mestach lived, worked and slept among his masterpieces, slowly and unconsiously becoming one himself. 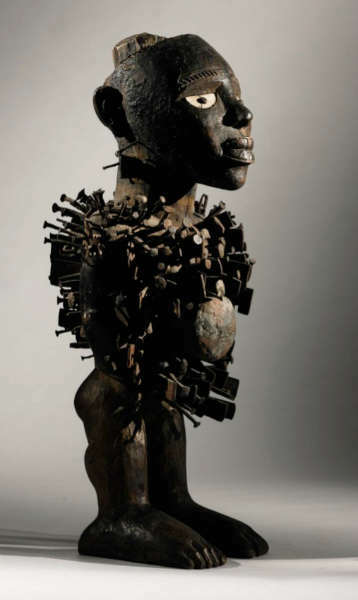 His continuing influence will forever be felt in the world of African art. The 2007 publication on his collection, L’Intelligence des Formes, the catalogue of the exhibition Mestach l’Africain, is a must-have. Rest in peace, Mr. Mestach. This entry was posted in Collectors, News on March 26, 2014 by admin. By dividing 72 by the annual rate of return, a collector can get a rough estimate of how many years it will take for the initial investment to duplicate itself. Vice versa, when you know the number of years it took for an object to double its value, you can deduct the interest rate. If an object’s value doubled in 7 years, you for example have an interest rate of roughly 10%. If an object you bought in the year 2000 now is worth double, you have an interest of 5 % (72/14) – still better what you get from the banks these days. So, practically, imagine you buy a € 10K object today and pursue a 7,5 % interest. Adding 1,5 % inflation, a rate of 9 % will imply, that the value of your acquistion will have to been doubled in 8 years, by 2022. If you buy wisely, that’s certainly possible. Notice that, although it gives a quick rough estimate, the rule of 72 gets less precise as rates of return become higher than 10 %. Extending the rule of 72 out further, other approximations can be determined for tripling and quadrupling. To estimate the time it would take to triple your money, one can use 114 instead of 72 and, for quadrupling, use 144. The Fang figure from the Georges de Miré collection below for example was sold by Christie’s in 2004 for € 371K (info). In December 2013, nine years later, Sotheby’s sold the same figure for € 1,441K (info). In 9 years, the value of this figure thus roughly quadrupled; equalling an interest rate of 14 % (144/9). Note that this formula doens’t consider inflation. You can also calculate the length of time it will take for inflation to halve the real value of your money with the rule of 72. Assume an average inflation rate of 3%. Divide 72 by 3, and you’ll quickly see that your money’s purchasing power would halve in 24 years. An inflation rate of 1,5 % (like in the US in 2013), makes that 48 years. This entry was posted in Opinions on March 25, 2014 by admin. Kongo figure. Height: 49,5 cm. Estimate: $500,000 – 700,000 USD. Image courtesy of Sotheby’s. On May 16, 2014 Sotheby’s NY will auction the second (and last) part of the collection of Allan Stone. 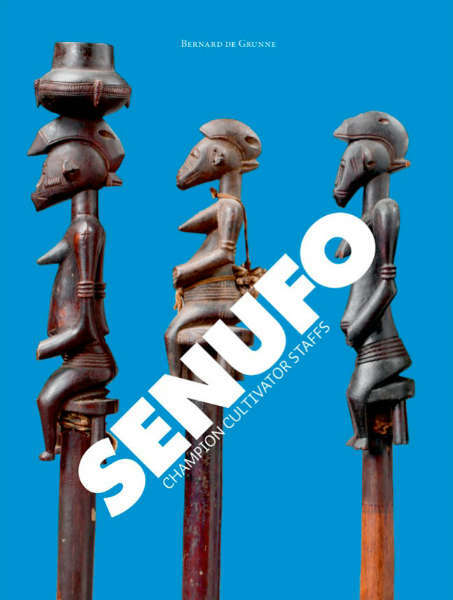 Following the success of volume one in November 2013 (reviewed here), volume two will feature a selection of African, Pre-Columbian, and American Indian Art of comparable quality, number and variety to the first offering. Highlights will be on exhibition at Sotheby’s Paris from April 9-17, and the entire Volume Two sale will be on view at Sotheby’s New York from May 10-15, in advance of the May 16 auction (info). Click here to learn more about Allan Stone. Below and above a selection of the featured Kongo power figures from the Democratic Republic of the Congo featured in the sale. 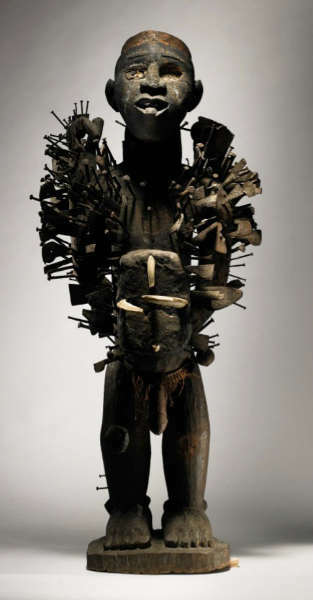 Kongo-Yombe figure. Height: 91,4 cm. Estimate: $700,000-1,000,000 USD. Image courtesy of Sotheby’s. 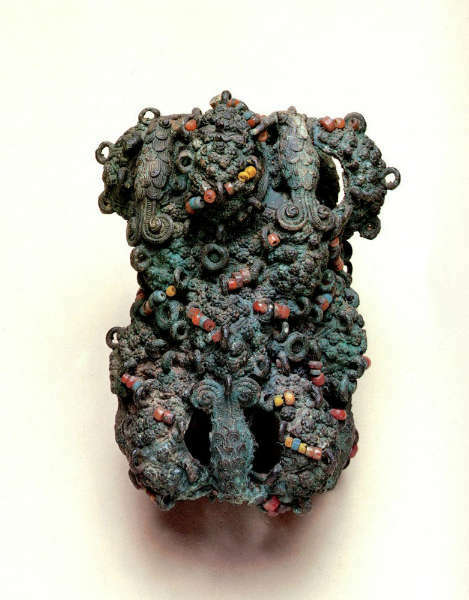 Kongo-Vili janus-headed dog-figure. Length: 72,4 cm. Estimate: $150,000 – 250,000 USD. Image courtesy of Sotheby’s. Kongo figure. Height: 62,9 cm. Estimate: $60,000 – 90,000 USD. Image courtesy of Sotheby’s. Kongo-Vili figure. Height: 53,3 cm. Estimate: $25,000 – 35,000 USD. Image courtesy of Sotheby’s. Kongo figure. Height: 52,7 cm. Estimate: $30,000 – 50,000 USD. Image courtesy of Sotheby’s. 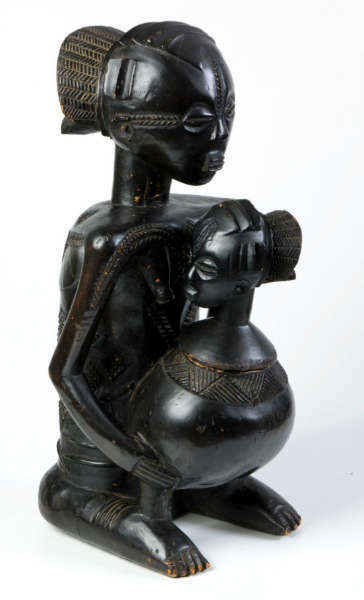 This entry was posted in Auctions, News and tagged Kongo on March 24, 2014 by admin. As always, Bernard de Grunne had made the effort to prepare a special themed exhibition for TEFAF. This year a presentation of 13 Senufo tefalipitya or ‘champion cultivator staffs’ took place. You can view the catalogue on de Grunne’s recently redesigned website, here. 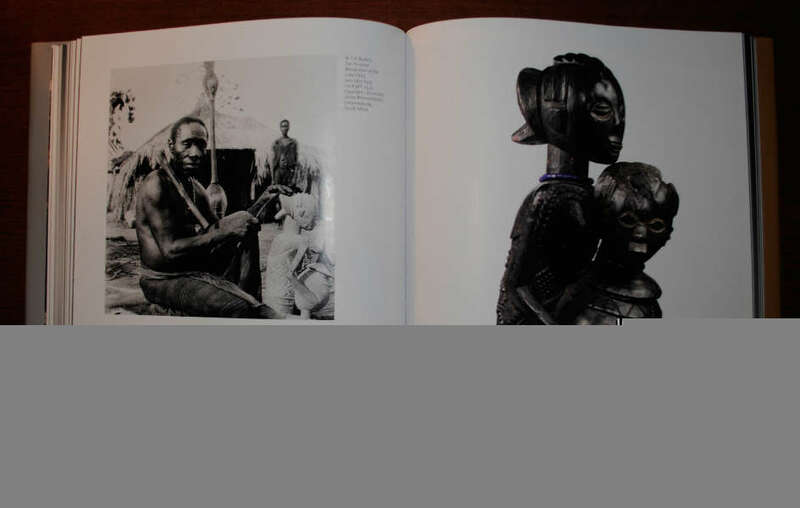 Highlights of his booth at Tefaf was the Bamana chiwara illustrated below. 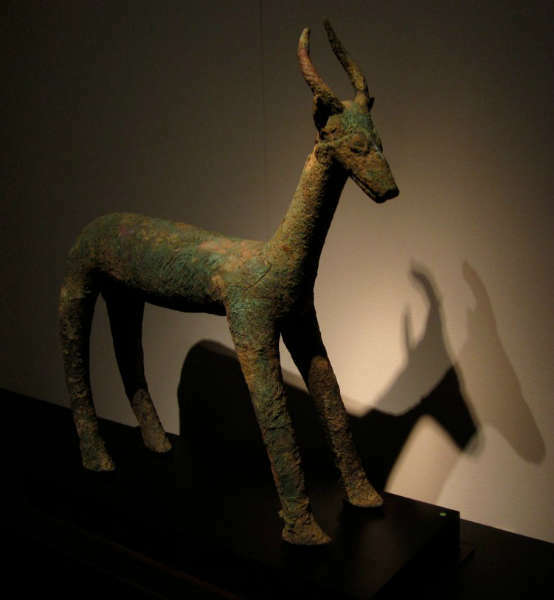 Extremely interesting was a big bronze antelope. Clearly an archeological find, this important piece was listed as “Djenne” (Inland Niger Delta), but with such ancient objects that just seems an arbitrary classification to me. Click here for a related example sold by Sotheby’s in 2010. This entry was posted in Fairs and tagged Bamana, Senufo on March 21, 2014 by admin. 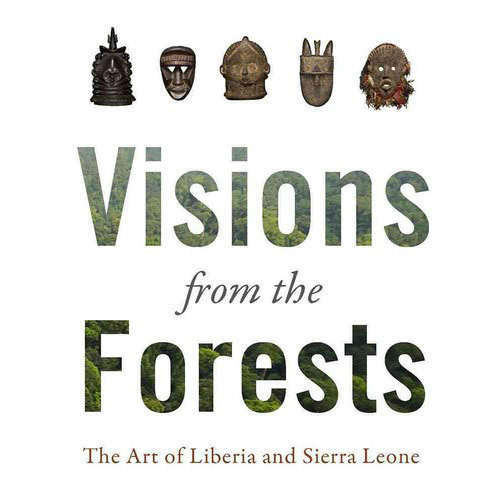 Visions from the Forests: The Art of Liberia and Sierra Leone will be on view at the Smithsonian’s National Museum of African Art April 9 through August 17. 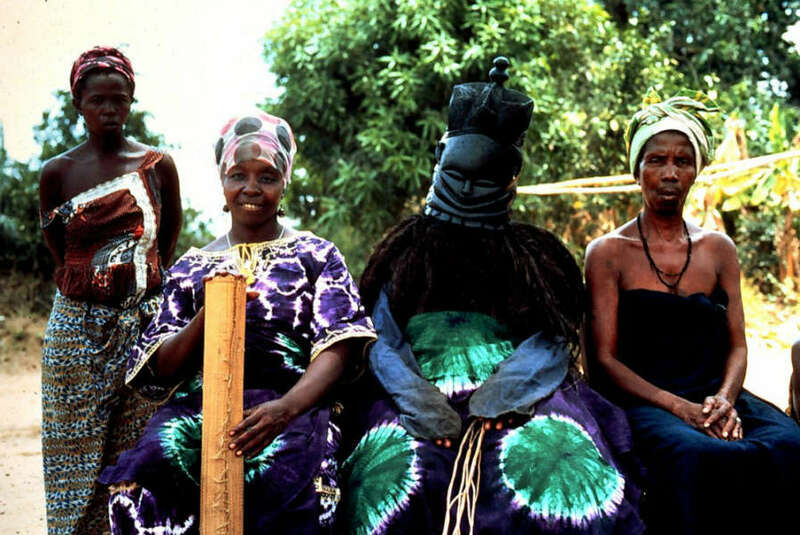 The exhibition features some 70 artworks from the collection of William Siegmann (1943–2011) that survey the traditional arts of Liberia and Sierra Leone. 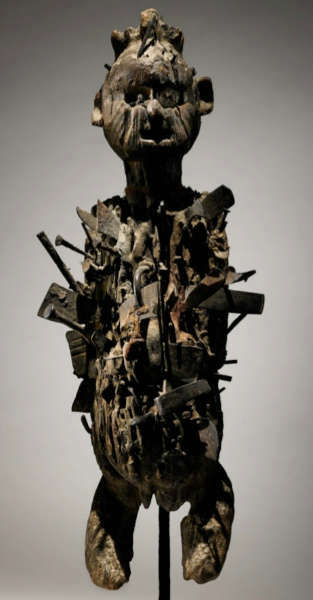 Siegmann, a former curator of African art at the Brooklyn Museum, lived and worked in Liberia from 1965 to 1987. While there, he began collecting art from Liberia and Sierra Leone. Siegmann’s collection, particularly rich in masks, provides an overview of the region’s traditional art forms, including numerous objects used in men’s and women’s initiation associations, jewelry and prestige objects of cast brass and horn, small stone figures dating from the 15th to the 18th centuries, and woven and dyed textiles. The exhibition, making its debut at the National Museum of African Art, is organized by the Minneapolis Institute of Arts in Minnesota. It is accompanied by a scholarly catalog that includes an essay on connoisseurship by Christine Mullen Kreamer, the National Museum of African Art’s deputy director and chief curator and additional contributions by Mariane Ferme, Barbara C. Johnson, Nanina Guyer, Daniel Reed, and Jan-Lodewijk Grootaers. With an emphasis on connoisseurship and the identification of artworks to particular artists or workshops, the exhibition hopes to reveal the deeply personal and scholarly connections forged by Siegmann during his many years of field research in Liberia and Sierra Leone. Jan-Lodewijk Grootaers, curator of African Art at the Minneapolis Institute of Arts since 2008, is also preparing another important exhibition. “Islamic Africa: Art and Architecture,” opening in March 2016, will examine the social and historical significance of the diverse forms of Islamic art and architecture that have developed in Africa over the last 1,500 years. This entry was posted in Exhibtions, Museums, News, Publications on March 21, 2014 by admin. Image courtesy of Petra Schütz / Detlef Linse. I recently discovered the fascinating website of Petra Schütz & Detlef Linse documenting their travels through Lobi-country in Burkina Faso. You can find it here; it’s great for the armchair-traveller. Going through these photos, I discovered the presence of Dogon ladders on some of these pictures. At least, a type of ladders often offered for sale as Dogon in the trade (examples 1, 2, 3). 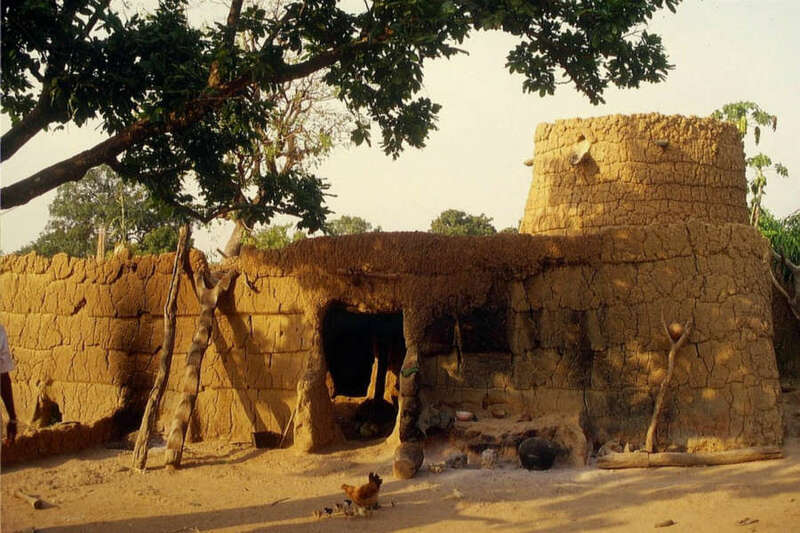 Clearly, the Lobi made use of very similar ladders, but apparently those of the Dogon are valued higher. Personally, I can’t tell the difference. 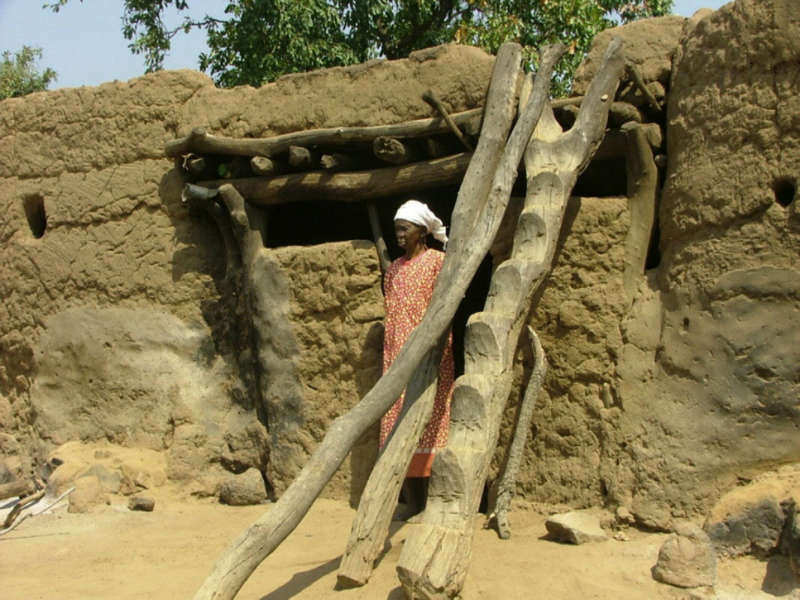 This entry was posted in Objects, Research and tagged Dogon, Lobi on March 17, 2014 by admin. Image courtesy of Boris Kegel-Konietzko, 1959. A few years ago, when I was still actively contributing to the Yale University – Van Rijn – Archive of African art, the German dealer Boris Kegel-Konietzko allowed us to include the field-photos from his travels through Songye-land in the database. The above picture, taken at Kabinda in 1959, was included in the batch. Of course, I did not hesitate to browse through the thousands of Songye figures in the archive to check if I could find this figure back. Great was my suprise, when I discovered this statue was now, in a slightly different state, in Yale’s own collection. Being part of the Benenson collection, it was donated to the Yale University Art Gallery in 2006 – without the Kegel-Konietzko provenance! 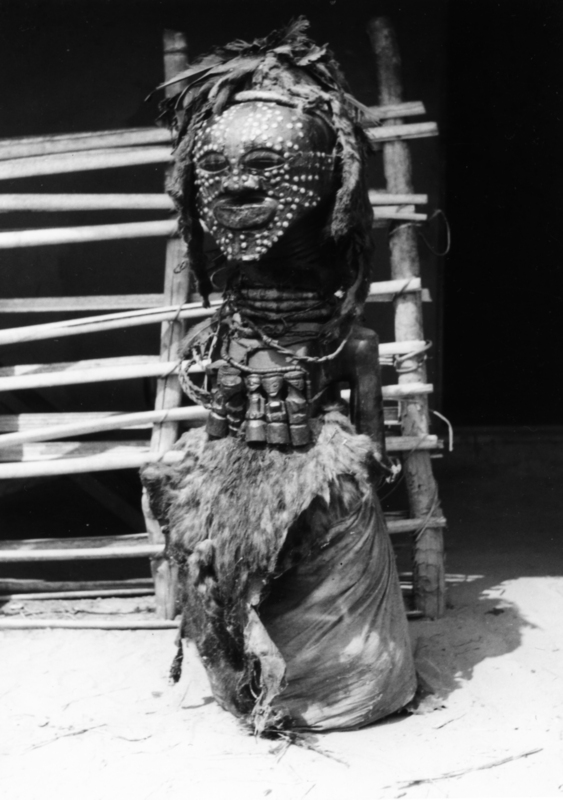 Thanks to this picture of the figure at its time of collection, we now know it was originally dressed with an animal skin and partly wrapped in a cotton cloth. The attached smaller figures were also original to the figure. Both field-photo and figure are published in Frederick J. Lamp’s catalogue of the Benenson collection, Accumulating Histories (p. 149). This entry was posted in Discoveries, Objects, Publications and tagged Songye on March 16, 2014 by admin.